Availability Booking Calendar is a PHP/MySQL based calendar script that shows availability, allows online bookings, accepts online payments, manages reservations and clients. A highly customizable calendar booking system which can be used almost everywhere where booking functionality is needed. Used by thousands of website owners already! 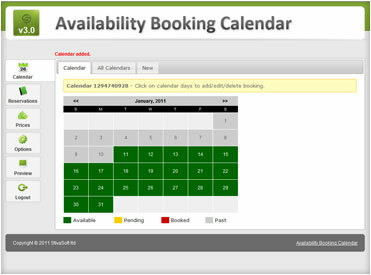 Availability Booking Calendar is very easy to install. An installation wizard script will set up the database and options file for you. Once installed all you have to do is to copy and paste a few lines of plain HTML code. The administration page lets you manage bookings and clients easily without any programming knowledge. For experienced web developers and web designers we have the Developer Package which includes the full PHP SOURCE Code and allows you to make your own changes. Availability Booking Calendar allows you to change the calendar size, color, font, borders, date and time formats, week starting days, etc. There are different options to customize your booking calendar further: define turn over days (half days bookings); allow/disallow payments/bookings; set currency and deposit payment; send email confirmations and more. Free installation support included! User license requires Zend but with the Developer license you receive full PHP SOURCE codes.